Yosko is deeply integrated with the EHR and provides a seamless and real-time flow of patient data among the EHR and mobile devices. 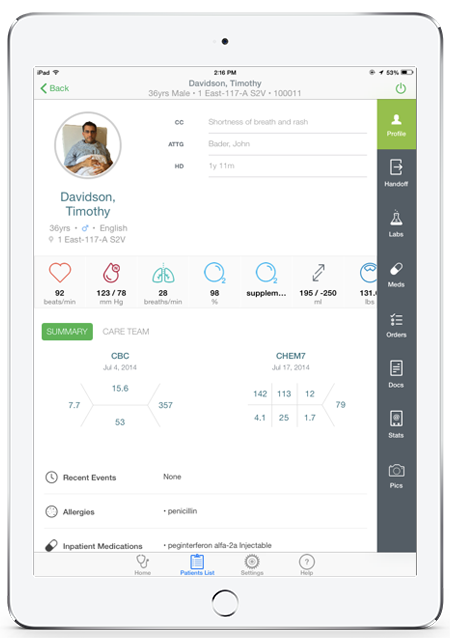 Designed by practicing physicians with deep insight in the hospital workflow, Yosko allows for smooth and safe patient care coordination on a single platform. Doctors and nurses are always on-the-go and patient care happens at the bedside. With Yosko, every aspect of patient care is possible at the point-of-care. Patient care is safely transitioned among a team of providers. Yosko eliminates a costly patient safety problem for hospitals nation-wide. Flexible options for easy on-the-go documentation: pre-populated note templates, voice-to-text data entry and Touch ID instantenous signing. Yosko allows for visual consultation through HIPAA compliant photo capturing. Even better, with just a few taps any photo can be inserted into and become a part of the patient's daily progress note. Access the clinical data you need at the point of care. The comprehensive hospital solution that provides efficient patient care coordination. The Yosko app gives clinicians a comprehensive access to the patient chart in the palm of their hand. Updates on the patient’s care from the past shifts are clearly passed along among teams (no more rushed huddles and interrupted verbal hand-offs). Snap a pic and share it with the care team or put in a progress note. Yosko creates a visual history of the important patient findings and they can all be part of the patient record.